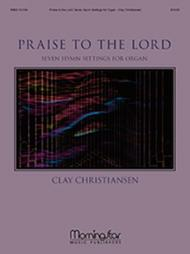 Praise to the Lord: Seven Hymn Settings for Organ composed by Clay Christiansen. For organ. Medium. Published by MorningStar Music Publishers (MN.10-749).Organist at the Salt Lake Tabernacle, Christiansen touches on everything from lush introspection to thundering toccata in this collection on the hymn tunes.Includes:LOBE DEN HERRENLUX BENIGNABOUNTIFULNEANDER (UNSER HERRSCHER)NEEDWELCOME GUESTSANFORD.